Is Your CME LMS Working Against You? Perhaps you’ve spent hours squinting at databases and poring over learner feedback, attempting to discover why so many of your learners are dropping out at a certain point in course. Or you’ve found that learner assessment scores are plummeting, but it has taken days to hear back from tech support on how to switch out course content. Or maybe your organization’s staff are spending their spare moments fielding questions from new learners on how to register, or access their courses—questions that could be answered quickly if the FAQ wasn’t so hard for users to find. You aren’t the only one. That may come as small comfort, but many CME directors, hoping to do their jobs better, unwittingly purchased an LMS that multiplied, rather than eliminated, their CME management headaches. If your LMS is monopolizing your time and frustrating your team— all without producing the learner outcomes that you hoped for when you signed on, then it’s the perfect time to decide to get what you want. What Kind of CME LMS Do You Really Need? Any platform “quirk” that compromises your productivity—like a long wait to reach a human once you’ve contacted a helpdesk—is an automatic deal-breaker, regardless of the other features on offer. Look for an LMS platform service that reduces or automates repetitive administrative tasks—like sending email updates to learners—while allowing you the option to customize when and how those tasks are performed. Your data is just that—yours. You shouldn’t have to purchase an added feature to compare historical and real-time course data, or to have the option to compare outcomes for individual learners. Data is your most valuable asset as you develop your long-term growth strategy for your program. Your new LMS should provide you with data transparency out of the box—making critical information easy to access, review, and interpret. Regardless of the size of your organization, platform scalability is an important criterion to use when looking for a new CME LMS. If you receive an influx of hundreds of new learners one week due to a successful marketing campaign, will you have to spend days dealing with registration fulfillment and course usability issues? Your LMS should offer learners an intuitive, user-friendly course design as well as an easy-to-navigate FAQ and self-help section that reduces the need for support calls. As a CME director, you are well aware that there is never a time when course data is unimportant to your decision-making process. You might spend days poring over your data looking for a relationship between a change in your curriculum and a downturn in learner performance over the last year. That should be your CME LMS platform’s job. However, unless you have an analytics department dedicated to your exclusive use (or you are using EthosCE), you and your staff will have to transform your raw data into insights manually—yet another time-intensive task that can slow your productivity. Look for an LMS that does the heavy lifting for you, at least when it comes to data analysis. EthosCE Analytics, which comes bundled with the EthosCE LMS, allows you to generate shareable data visualizations instantly from your admin dashboard, transforming raw data into actionable insights from every level of your CME program data. As you strive to provide the best possible educational experience for your learners, you are always on the lookout for ways to improve the practical aspects of their activities. You want to make the course more accessible for students who are new to online learning to navigate. You hope to help struggling learners regain their confidence. You try to ensure that your curriculum makes the most challenging topics in your curriculum accessible. Your new LMS should empower (rather than complicate) your commitment to academic excellence. Find an LMS that lets you easily update activities components in response to learner performance data. With the EthosCE CME LMS, you can automatically generate an email that will be sent to learners who performed poorly on an assessment, offering them a link to additional educational resources on the LMS. You can also update course materials with a few clicks when your data reveals that specific questions are problematic for both high-performing and struggling learners. There’s no way around it—an “ordinary” CME LMS can limit your productivity and overtax your staff. Without a full-featured analytics suite to manage and interpret your data, you and your team are looking at weeks of effort to get the insights that you need to troubleshoot learner performance issues. Without an easily customizable activities format, you may have to find a third party web developer to help you make your content more user-friendly, even though your students need support now. As your program grows, so will the amount of time that you waste trying to help your LMS do its job. It’s time to dump the dead weight. EthosCE is a purpose-built platform, with every component of our LMS designed to address the needs of the CME learner. Your learners will find user-friendly self-help options and a simple activity-to-assessment process that makes learning frictionless. For more than 16 years, we’ve helped thousands of organizations get the CME LMS that meets their needs. If you don’t want to fix your LMS “solution” anymore, click through to learn about our features and talk with us. 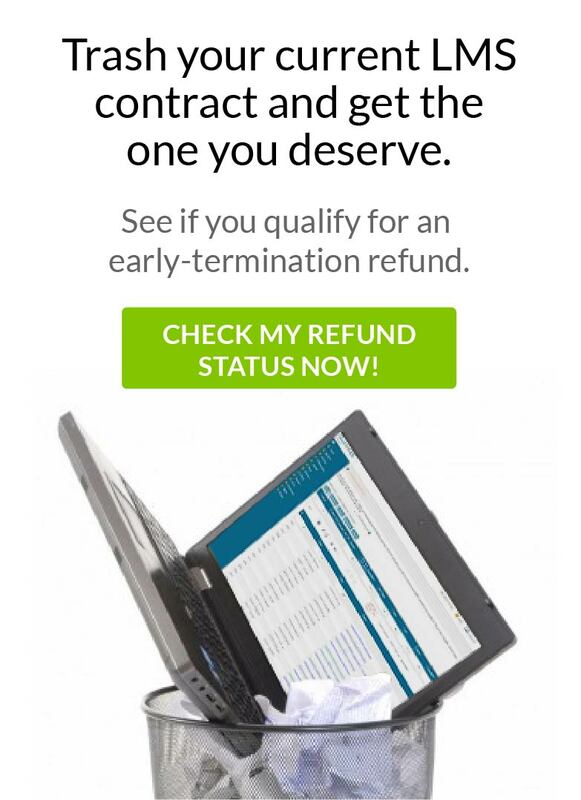 We’ll even help cover early termination fees so you can get started with us right away.